We report the first use of swept-source microscope-integrated optical coherence tomography (SS-MIOCT) capable of live four-dimensional (4D) (three-dimensional across time) imaging intraoperatively to directly visualize tube shunt placement and trabeculectomy surgeries in two patients with severe open-angle glaucoma and elevated intraocular pressure (IOP) that was not adequately managed by medical intervention or prior surgery. We performed tube shunt placement and trabeculectomy surgery and used SS-MIOCT to visualize and record surgical steps that benefitted from the enhanced visualization. In the case of tube shunt placement, SS-MIOCT successfully visualized the scleral tunneling, tube shunt positioning in the anterior chamber, and tube shunt suturing. For the trabeculectomy, SS-MIOCT successfully visualized the scleral flap creation, sclerotomy, and iridectomy. Postoperatively, both patients did well, with IOPs decreasing to the target goal. We found the benefit of SS-MIOCT was greatest in surgical steps requiring depth-based assessments. This technology has the potential to improve clinical outcomes. Optical coherence tomography (OCT) is widely used in clinical glaucoma to aid in screening, diagnosing, and monitoring progression of glaucomatous disease., In addition, OCT has been used postoperatively in surgical glaucoma to evaluate outcomes and plan potential revisions., The utility of OCT intraoperatively for glaucoma is readily apparent, as many of the surgical steps require accurate depth determination, such as scleral dissection and suture placement. With recent technological advancements, microscope-integrated OCT (MIOCT) has emerged as an intraoperative tool that allows for simultaneous imaging and surgery. However, its use to date has been limited to spectral-domain MIOCT (SD-MIOCT), capable of only two-dimensional (2D) B-scan imaging.,, Imaging with SD-MIOCT is limited because the B-scan has to be repeatedly matched to the region or tool of interest. We report the first use of novel swept-source MIOCT (SS-MIOCT) capable of live 4D (three-dimensional across time) intraoperative imaging during two common glaucoma surgeries: tube shunt placement and trabeculectomy. An 89-year-old male presented with severe open-angle glaucoma and documented field loss with intraocular pressures (IOPs) in the mid-teens. He previously underwent selective laser trabeculoplasty (SLT), trabeculectomy with Ex-PRESS shunt (Optonol, Kansas City, MO, USA), and Ahmed S-2 glaucoma drainage device (New World Medical Inc., Rancho Cucamonga, CA, USA) placement. The patient also had proliferative diabetic retinopathy with a persistent vitreous hemorrhage and an IOP that remained elevated at 18 mmHg despite maximally tolerated medical therapy. He was monocular, with a visual acuity of only hand motion in his left eye, the worse eye. Slit-lamp examination revealed a deep anterior chamber of the left eye without neovascularization of the iris or angle. Proper Ahmed glaucoma drainage device positioning in the anterior chamber was noted. A pars plana vitrectomy with concurrent insertion of the second Ahmed glaucoma drainage device was planned to surgically control the patient's IOP in his left eye. A pars plana vitrectomy was first performed, followed by a limbus-based peritomy 4 mm posterior to the limbus. An Ahmed FP7 glaucoma drainage device plate was placed, and SS-MIOCT was used to guide a 23-gauge needle through the sclera 2 mm from the limbus inferotemporally and into the anterior chamber [Figure 1]. The SS-MIOCT assisted in avoiding the peripheral iris and trabecular meshwork, thereby preventing the creation of peripheral anterior synechiae (PAS) formation postoperatively. The tube was subsequently placed through the tract under direct visualization with SS-MIOCT, ensuring proper placement of the tube anterior to the iris, and without corneal touch [Figure 2]a. The tube was then secured to the globe using two 9-0 nylon figure-of-eight sutures, followed by a donor scleral patch graft affixed using two interrupted 7-0 Vicryl sutures. SS-MIOCT feedback was used to avoid scleral perforation during suture placement. Finally, the conjunctiva was reapproximated. At 3 months postoperatively, his IOP stabilized at 11 mmHg and visual acuity improved to 20/80. Slit-lamp examination confirmed proper positioning of the Ahmed tube shunt anterior to the iris and without corneal touch. A 41-year-old male with severe open-angle glaucoma presented with progressive field loss despite an IOP of 12 mmHg in the right eye on maximum medical therapy and prior SLT. Work-up for associated causes was negative. Best-corrected visual acuity in the right eye was 20/30, and cup-to-disc ratio was 0.9. The patient had previously undergone scleral buckle placement and was noted to have a narrow and tight band in the right eye. ]. A sclerotomy was created by en bloc excision of a 1 mm × 2 mm section of corneotrabecular tissue, and a surgical iridectomy was created under SS-MIOCT visualization. The flap was secured with two interrupted 9-0 nylon sutures using SS-MIOCT feedback to avoid scleral perforation and tied in an adjustable fashion. The anterior chamber was then filled with BSS and the sutures adjusted for adequate flow. 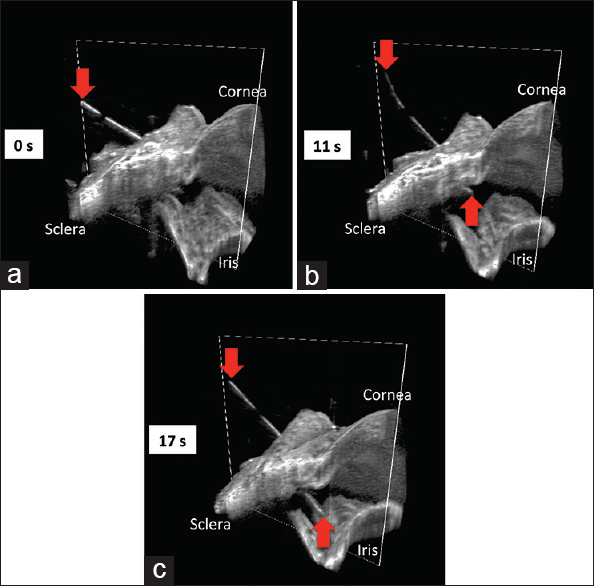 SS-MIOCT was used to simultaneously visualize the scleral flap, iridectomy, and sclerotomy [Figure 2]b. Sutures were tied, and the knots were buried. Excess Tenon's capsule was excised, and the conjunctiva was reapproximated. The anterior chamber was filled again with BSS, and the bleb was noted to elevate nicely without any leak. At postoperative week 1, his visual acuity was still 20/30 and his IOP had improved to 6 mmHg, which remained stable at his last visit on postoperative month 2. Intraoperative imaging in glaucoma has thus far been restricted to 2D B-scan imaging using SD-MIOCT., Consequently, the OCT beam must be actively and constantly realigned to instruments that are in motion, making real-time intraoperative guidance more demanding. Swept-source systems allow for faster imaging across a larger imaging range, making them ideal for evaluation of instruments in motion during surgical maneuvers., We are the first, to the best of our knowledge, to use SS-MIOCT for real-time volumetric visualization during glaucoma surgeries. This allowed for immediate modifications, confirmation of accurate positioning, and minimization of intraoperative complications resulting from inaccurate depth measurements in tube shunt and trabeculectomy surgeries. 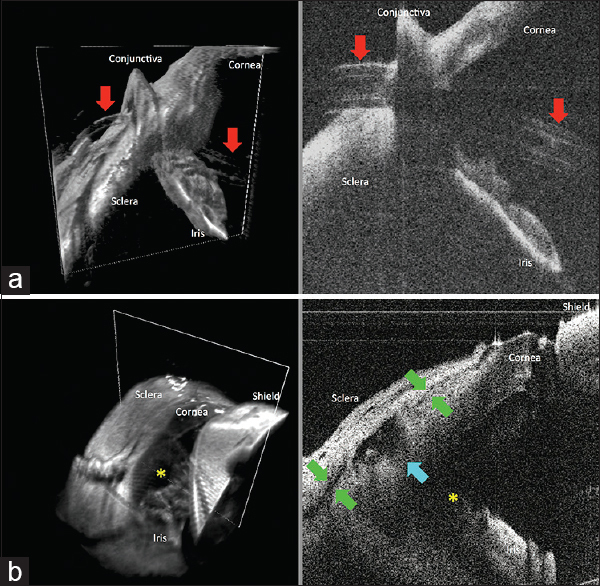 While experienced surgeons may have already gained an intuitive understanding of depth, less experienced surgeons such as trainees may benefit from the direct visualization of depth offered by SS-MIOCT. Specific surgical steps that benefited from the enhanced visualization of SS-MIOCT include scleral tunnel creation, tube shunt positioning and suturing, scleral flap creation, sclerotomy, and iridectomy. In our experience, SS-MIOCT is especially more useful than conventional microscope visualization in certain situations, such as in patients with an opaque cornea, thin sclera, shallow anterior chambers, PAS formation, and any difficulties visualizing the position of the lens. Another potential benefit of SS-MIOCT visualization could be to identify the anatomic limbus, which may be wider and more posterior than the surgical limbus in certain patients, such as myopes, helping prevent dissection, or tube insertion too anteriorly. Future studies may explore the utility of SS-MIOCT in cases of tube implantation into the vitreous cavity, kinked tube exploration, and needle bleb revision since these maneuvers are currently performed in blind fashion. As SS-MIOCT gains more widespread use, its intraoperative benefits over conventional microscopes may lead to better postoperative results for glaucoma surgeries. This work was supported by the National Institutes of Health Bioengineering Research Partnership Grant R01-EY023039, the National Institutes of Health R01-EY024312, and an unrestricted grant from Research to Prevent Blindness to the Department of Ophthalmology, Duke University School of Medicine. At the time of this work, Dr. Izatt was Chairman and Chief Scientific Advisor for Bioptigen and had corporate, equity, and intellectual property interests (including royalties) in this company. Dr. Toth receives financial support from Alcon, Bioptigen, and Genentech, has an intraoperative imaging patent with Duke University, and receives consulting fees from ThromboGenics. For the remaining authors no conflicts were declared. Grewal DS, Sehi M, Paauw JD, Greenfield DS; Advanced Imaging in Glaucoma Study Group. Detection of progressive retinal nerve fiber layer thickness loss with optical coherence tomography using 4 criteria for functional progression. J Glaucoma 2012;21:214-20. Nouri-Mahdavi K, Nikkhou K, Hoffman DC, Law SK, Caprioli J. Detection of early glaucoma with optical coherence tomography (StratusOCT). J Glaucoma 2008;17:183-8. Hong J, Chen J, Yang Y, Wei A, Kong X, Yu X, et al. Optical coherence tomography assessment of angle anatomy changes after trabeculectomy in primary angle-closure glaucoma. J Glaucoma 2016;25:244-7. Kojima S, Inoue T, Kawaji T, Tanihara H. Filtration bleb revision guided by 3-dimensional anterior segment optical coherence tomography. J Glaucoma 2014;23:312-5. Heindl LM, Siebelmann S, Dietlein T, Hüttmann G, Lankenau E, Cursiefen C, et al. Future prospects: Assessment of intraoperative optical coherence tomography in ab interno glaucoma surgery. Curr Eye Res 2015;40:1288-91. Kumar RS, Jariwala MU, Sathi Devi AV, Venugopal JP, Puttaiah NK, Balu R, et al. A pilot study on feasibility and effectiveness of intraoperative spectral-domain optical coherence tomography in glaucoma procedures. Transl Vis Sci Technol 2015;4:2. Siebelmann S, Cursiefen C, Lappas A, Dietlein T. Intraoperative optical coherence tomography enables noncontact imaging during canaloplasty. J Glaucoma 2016;25:236-8. McKee H, Ye C, Yu M, Liu S, Lam DS, Leung CK. Anterior chamber angle imaging with swept-source optical coherence tomography: Detecting the scleral spur, Schwalbe's line, and Schlemm's canal. J Glaucoma 2013;22:468-72. McNabb RP, Challa P, Kuo AN, Izatt JA. Complete 360° circumferential gonioscopic optical coherence tomography imaging of the iridocorneal angle. Biomed Opt Express 2015;6:1376-91. Pasricha ND, Shieh C, Carrasco-Zevallos OM, Keller B, Izatt JA, Toth CA, et al. Real-time microscope-integrated OCT to improve visualization in DSAEK for advanced bullous keratopathy. Cornea 2015;34:1606-10.